Activity remains elevated but stable; the lava flow increased its length a bit to 600 m this morning, while explosions have become a bit weaker and occurred at rates of 2-3 per hour. Many of them produce shock waves that rattle windows and roofs of houses in nearby villages. An increase in activity was indicated by the volcano observatory today. The explosions (strombolian type) at the summit vent occur now at rates of 6-8 per hour and lava effusion increased. Currently, the lava flow is headed towards the Cenize canyon on the SW side. It is a possibility that this activity continues to build up towards another paroxysm, in which case the occurrence of pyroclastic flows (mainly by collapsing lava flow fronts) is a likely and dangerous scenario. INSIVUMEH reports 7 explosions during the past day with ash plumes up to 700 m height. Activity has increased since yesterday. The volcano observatory reports strombolian-type explosions that eject incandescent material to 100 m and ash plumes to 500 m height. Shock waves and incandescent avalanches accompany the explosions.  A new (but so far weakly alimented) lava flow has started to descent from the summit crater. The observatory reports no significant changes. About 30-35 small to moderate explosions occurred during 3-4 Dec, often with strong shock waves that rattled windows and roofs in up to 6 km distance. Ash plumes rose to about 4.2 km altitude (500 m height) and produced light ash falls in W and SW directions (Morelia, Panimache and other villages). At night, incandescent avalanches from the crater are visible. No significant changes in activity have occurred. The volcano produces small to moderate strombolian-type explosions with ash plumes rising up to about 800 m. The lava flows are no longer active. The lava flow on the upper southern slope was no longer active this morning (while it was still 100 m long yesterday). The volcano is back to its typical mild explosive activity from the summit crater with strombolian bursts generating ash plumes up to about 600 m high, sometimes accompanied by loud shock waves. Activity has returned to normal levels, with weak explosions (ash plumes of 500-600 m height drifting W and NW). The lava flow towards the Ceniza canyon remains weakly alimented and had a length of 200 m yesterday. Today, the volcano seems to have calmed down again. This was the 4th (and so far weakest) paroxysmal phase of the volcano this year. At the same time, explosive activity at the summit crater remained at low to moderate levels, with strombolian explosions that produce ash plumes of up to 800 m height and incandescent jets visible from distance. Some of the explosions generate shock waves that can be felt and heard in up to 15 km distance, causing roofs, doors and windows of houses to rattle. Fine ash fall occurred in Panimaché, Morelia abd Sangre de Cristo. A new lava flow towards the Taniluya canyon (S side) started on 11 Nov and reached a length of 500 m this morning. Explosive activity at the summit has remained stable with occasional weak to moderate explosions ejecting ash plumes to up to 700 m height and producing sometimes loud shock waves. The risk of pyroclastic flows triggered by collapse of the steep lava flow fronts is elevated. Weak to moderate strombolian activity at the summit craters continues with little changes. Ash plumes rose to up to 500 m above the crater and drifted about 10 km in westerly directions, where light ash falls occurred in San Pedro Yepocapa and the villages of Sangre de Cristo, Morelia, Panimaché. The stronger explosions produce often loud rumblings and incandescent avalanches on the upper slopes. Activity has decreased and shifted back to be mainly mildly explosive. INSIVUMEH reported a few explosions with ash plumes of about 300 m height yesterday. The lava effusion has decreased. The lava flow was still active yesterday morning, but only 150 m long. Activity is very low. Almost no explosions have occurred recently. The lava flow on the upper south flank seems to be still weakly active. Activity has been weak recently. The lava flows on the upper southern flank is still active, and was about 100 m long this morning, headed towards the Trinidad canyon. Explosions have been few and only produced ash plumes rising a few 100 meters.